In the creation of a community cultural district, the overriding goal is to produce an environment in which all forms of artistic expression and the artists themselves can live and flourish. The Shreveport Common Public Art Plan includes over one hundred functional and aesthetic Public Art works including plans for artist-designed green spaces and a park with performance pavilion, creative seating, signage, and many other opportunities. 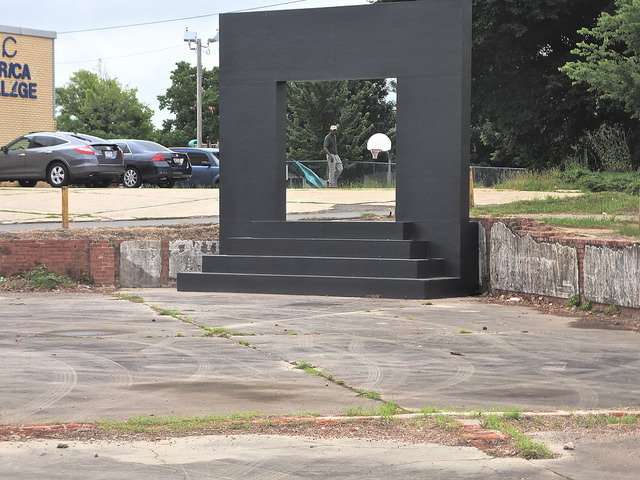 SRAC and the City of Shreveport implemented a Temporary Art Program for SHREVEPORT COMMON to motivate new works to help artists experiment in the field of Public Art. One piece of the SHREVEPORT COMMON Public Art collection is ART the Dalmatian. ART stands guard over the former fire station, now Central ARTSTATION, a 19.5 foot tall fiberglass sculpture. William Joyce & Brandon Oldenburg, Academy Award-winning local animators gifted their design to SRAC as a “housewarming” present, with fabrication by Junoworks, CO funded by Educational Foundation of America. ART is most visually powerful at night, as his brilliant LED spots change color constantly - programmed or user-controlled - providing a fantastic light show. Gallery below: selection of some past and present temporary artworks designed for and displayed in Shreveport Common. SHREVEPORT COMMON UNVEILS 12 UNCOMMON MURALS designed by area Artists and installed on buildings throughout the 9-blocks of Shreveport Common! Click to learn more!